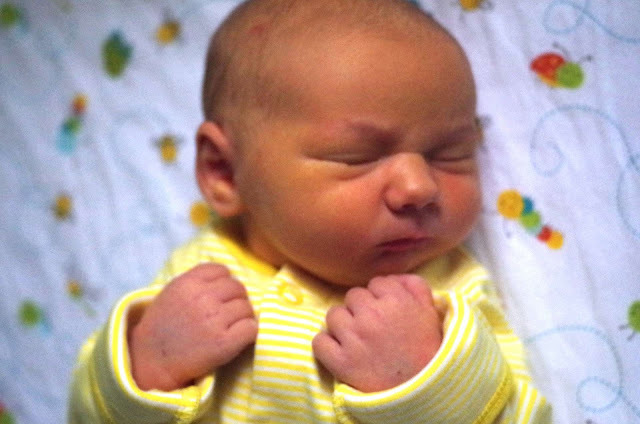 A month before hearing that Dominic was terminal, we had to come up with Christmas gifts for our families. Given how many amazing photos there were of him, a month-by-month calendar made sense. From the chubby cheeks when he was born to the omnipresent smile and eventually thumbs-up later, there were no shortage of choices. It was the 2015 calendar, and until last month it still hung in our house. It was forever December 2015, the photo of him wearing a Santa hat in the main hallway towards Unit 1 at the Alberta Children's Hospital. Turns out, the calendar still hung in a couple other places. One friend who we'd given one to got new calendars affixed beneath it, recycling the monthly photos of him. It's never time to move on, but this year we've started to find ways to incorporate Dom into our new life with Samantha. She's started to recognize there's another baby with us in photos around the house, and that it's not her. So 2019 has the Dominic and Samantha calendar. Photos in each month of both of them, except for their birth months when they get the month for themselves. And September, the month he died, is mainly photos of him. No, this isn't the announcement of some new fundraiser. 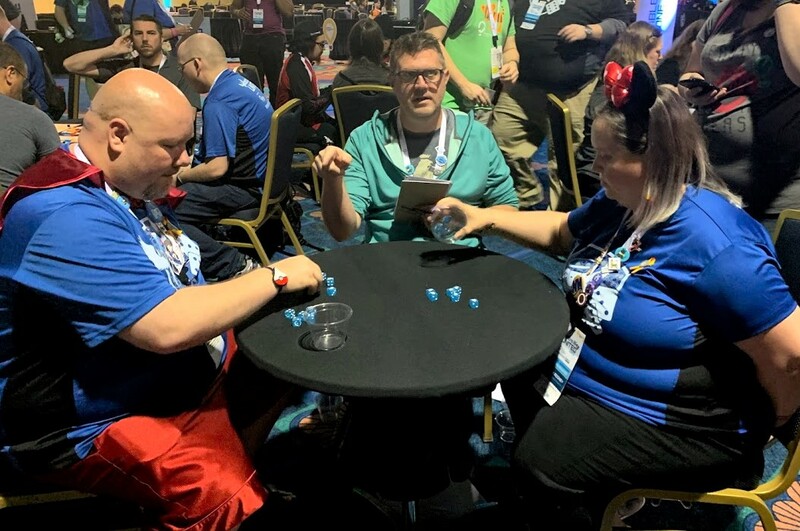 We're signed up for another year with Extra Life and are anxiously looking forward to the Extra Life United conference and tournament in March. We can even tell you the date for the Medicine Hat Mavericks' Superhero Night - Saturday, July 20! The mini golf tournament will hopefully return, as will the online auction. And there is some early interest in doing a public 24-hour gaming marathon again... but we'd need help to make it happen. If you're interested in taking a leading organizational role, let us know. We are proud to announce that the apparel sales from December resulted in a $600 donation to Helping Families Handle Cancer! There are still a handful of cotton shirts and tank tops that weren't sold. 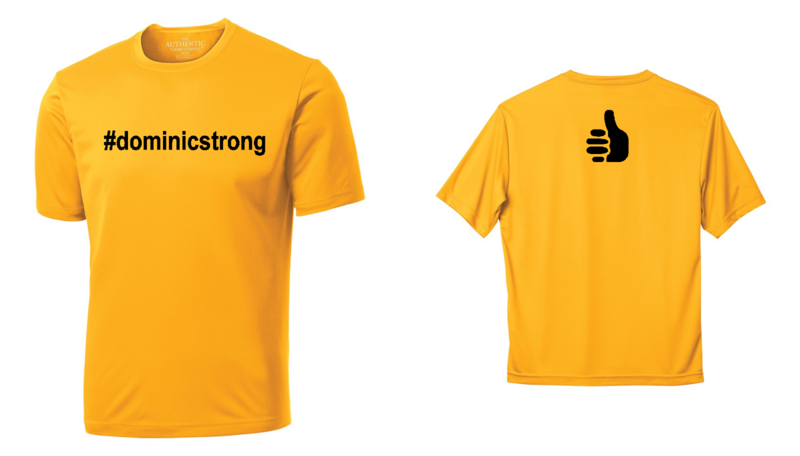 If you're interested just email donations@dominicstrong.com with what size in what style you're looking for. If we have it, they'll be $25 per item (plus shipping). Not much other news but hope you've had a good start to the new year. Christmas can be the hardest time of year. Days are at their shortest, so there's less sunshine. It's cold. And every happy person, every happy family has the potential to remind unhappy people, people who have suffered loss exactly what they're missing. Some days it's easiest to put your head down and just try to get through it. Or serendipity occurs and all you can do is thank the universe for what you still do have. We put the call out for a new order of #Dominicstrong clothing last month. That post has 173 hits as of today, making it by far the least-read thing ever on this blog. I was not optimistic. For all we do for the Alberta Children's Hospital via Extra Life, this was one thing we wanted to do for Helping Families Handle Cancer, which is a much less-known charity but still so valuable to families in our part of the province. The order wasn't huge, about 30 items, and when it's all said and done we should be able to donate about $450. And that's fine. That money will be appreciated and used well. And then I screwed it up. On the invoice sent to us, I didn't see that I was agreeing to cotton shirts, not the dryfit ones we wanted. 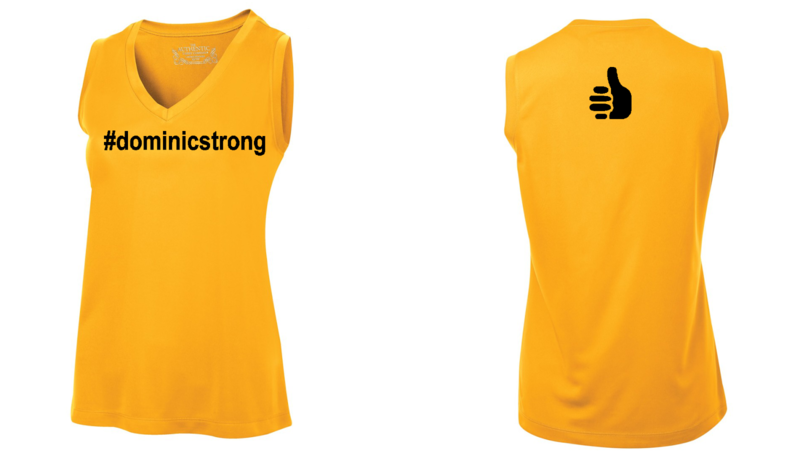 Black, cotton ladies tank tops instead of the gold, dryfit ones we announced. I had done a poor job of communicating what I wanted. When the box of clothing arrived, I was mortified. We had no choice but to re-order what we wanted. Thankfully, Custom ImageWear generously offered to do the corrected order at cost. We paid for it out of pocket and will not be shorting HFHC. Actually, we might be able to give more. You see, we now have all those incorrect shirts and tank tops. Gold ones with black lettering and logos. But in cotton, and only in the sizes that people had ordered for the dryfit. And some of the people who bought the dryfit ones have anted up and bought the matching cotton ones too. We will sell the cotton ones for $25 apiece. 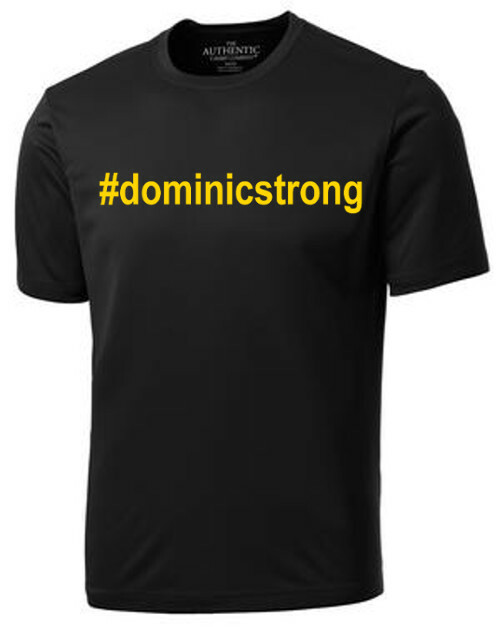 If you're interested, simply email donations@dominicstrong.com or contact either Trish or I privately and we can let you know what sizes remain. It was already going to be a quiet Christmas. I'm working Christmas Day for the first time in a while, which is only fair since co-workers have done it regularly, and I got lucky with holidays and off-days a couple times. We won't have much under the tree because we're going to Orlando in March for Extra Life United, a charity and gaming event we first went to in 2016. It is not cheap to do, and we are grateful Trish's work has agreed to let her take the time off during tax season. Seeing our friends in that community again will be like a late Christmas. On Sunday we had a bit of Christmas shopping to do. It seemed like around every corner was someone I knew, all of whom had a smile and kind words for us. Got a discount on a board game we have to learn to play for Extra Life United. Dropped by EB Games in the mall where the manager still remembers us and will give me a call once specially-branded Extra Life/Microsoft socks arrive (supporting Children's Miracle Network!). It got to the point we stopped on a street and a guy came around the corner walking his dog, stopped, so we rolled down our window and chatted. After shopping, we went to the local Ihop for brunch. At the end of our meal our waitress told us someone had paid our bill, with a message: "Always be Dominicstrong." Whoever you are, thank you. We're so lucky to have this community. And we hope that the charity work we do can help other families, not just during the holidays but all year long. By the way, since we started doing Extra Life in 2013, just a month after Dom's leukemia diagnosis, participants under the #Dominicstrong Extra Life banner have raised more than $175,000 (estimate, prior years collected in US dollars). This year's total sits at $24,115 (Canadian). Special thanks to Kevin Braun, whose Nov. 25 game day pushed him to nearly $5,000 alone and ended with him shaving his head and beard! 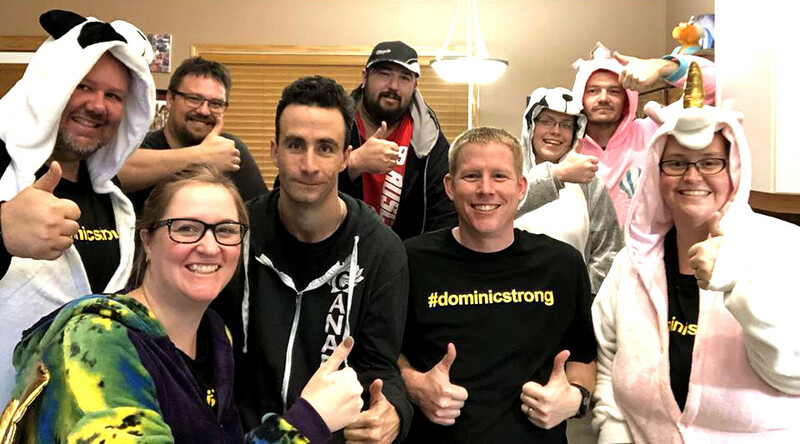 One week ago our team #Dominicstrong total on the Extra Life website showed that we'd raised $13,600 out of the goal we'd set of $15,000. That wasn't entirely accurate. Our Superhero Night game day with the Medicine Hat Mavericks raised $1,500 which was simply sent as a cheque to the Alberta Children's Hospital (and not counted in our Extra Life numbers). About $2,000 was donated in U.S. currency, so worth an extra $600 when you convert it. They now accept Canadian currency, so long as you use their credit card option. We knew game day would generate more money, but for the first time since 2014 we weren't doing a public 25-hour event. We decided after last year that it was just too much work for too few results. I wondered whether we could raise the same amount from home. We shared the heck out of our individual pages. We told family and friends. 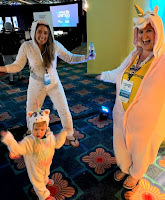 We teased doing a Baby Shark video, bought onesies to celebrate reaching our $15,000 goal, then set to work getting individual team members to goals earning them Extra Life shirts (at $200), then medals (silver at $500, gold at $1,000). All while playing a variety of video and board games all over Medicine Hat. - Sarah, Dave and Zach drove all the way from Manitoba to play with our team. 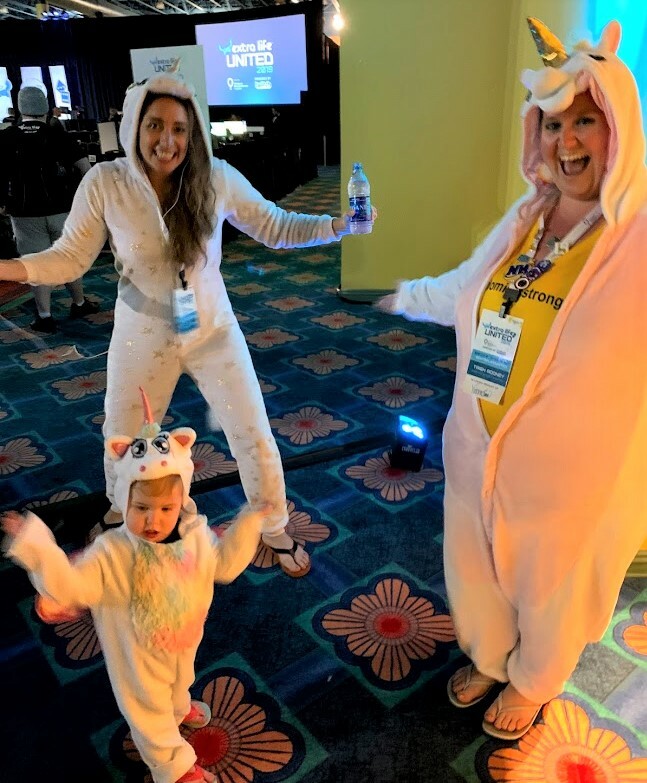 - James agreed to wear a mermaid onesie if we got him to $500 (we totally did). - From Calgary, Tamara decided she would chop off seven inches of hair if she could help raise an extra $500 (success!). - Elsewhere in Medicine Hat, a group of our friends held their own game day and raised nearly $700. We met up with them for some Pokemon Go mid-day. - Other friends in Cold Lake, Lethbridge and Calgary did their own game days and took in donations for our team. As for the games, we played a ton. From Mario on the old SNES to VR at SixoneSix Entertainment downtown, board games and even ping pong. Party games like Jackbox and console games like Rocket League. We held our now-annual bonus hour tournament (taking place before the daylight savings time change set the time back for a second 2 a.m.), Bob winning the title belt. We finished strong, though exhausted. In the past week, our team raised more than $5,000. Our total now sits at $19,040. When you factor in the Mavericks game day and the currency exchange, it's more like $21,640. Thank you everyone who contributed. I like to think Dominic's giving us all a big thumbs up for a job well done. We had Superhero Night. Then the mini golf tournament. And of course the massive online auction. Now, with five days (gulp) until we play games for 25 hours straight as part of Extra Life, fundraising for the Alberta Children's Hospital, we have one other thing to add. And I won't lie, this one's a bit selfish. 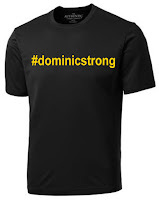 When the #Dominicstrong T-shirts were sold a few years ago, we wound up with some extra items that we never did sell. Seven ladies small size shirts are still ready to go if anyone wants them. We also wound up with a couple onesies even though we had no plans on trying for another child. And then we had Samantha. Now 20 months old, she's grown out of all the #Dominicstrong stuff we had for her. Naturally, we'd like to have something for her to wear as she continues to grow. A few people have said over the years they'd like a new shirt, or they wish they'd gotten in on the original order. Well, we hope those people are still around! We're working with Custom ImageWear (https://www.facebook.com/customimagewear) to bring you a new batch of #Dominicstrong shirts! The ones for toddlers can only come in black with gold graphics, the same as the old ones did. But for the rest of you, we're doing a gold-coloured shirt with black graphics. 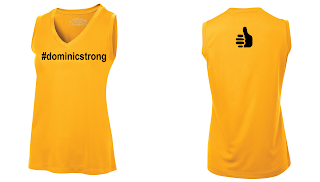 #Dominicstrong on the front, the thumbs-up on the back. And as with the last batch of clothing we did, we are donating the proceeds of this to Helping Families Handle Cancer. They're the group that works with families having trouble paying bills and mortgages, among other things, as a result of a cancer diagnosis. They helped us and though they're not the biggest charity, they've given nearly $600,000 out to nearly 700 families over the years. We are so thankful for them. We're asking $20 for the toddler shirts (sizes 2T-8T, black shirt with gold graphics), and $30 for adult shirts (T-shirt OR women's v-neck tank top, S-XXXL). If you don't live in Medicine Hat, shipping will be extra, though if you're in Calgary and can wait until the week after Christmas (or will be at Extra Life United in Orlando and can wait until March!) we can certainly bring them to you. If you're interested simply email donations@dominicstrong.com and let me know what you'd like. We can figure out the rest from there. I will send in the final order Nov. 15 at noon so you've got until then to get in touch with me! Thanks for all of your support. Hey folks, sorry I didn't write earlier this week but it's been busy, and it feels like anyone who would want to know about the annual #Dominicstrong auction already does! The auction, which runs off our Facebook group (https://www.facebook.com/groups.dominicstrong), began Friday with 131 items and has since grown to 132 items because I managed to forget one. Mistakes happen. There's everything from #Dominicstrong dice and special word art items to a signed Johnny Gaudreau (Calgary Flames) jersey and even an incredible six-foot-long bench. So many gift certificates, golf, entertainment and, well, there's 132 items: It's quite a list. I'm always afraid the auction has become so big that items will get missed and not bid on. There are a handful as of 11 a.m. of today's final day that still have no bids, but I'm crossing my fingers that changes. And there are always a few items that draw a ton of attention, which is super fun to watch. We raised $10,921 last year, and even if we don't break that number this time around, it'll be a success. I had said earlier this year we wouldn't have as much time to run the auction this year, yet we still have wound up doing as much or maybe even more work than ever before. I guess once you start something like this, it's hard not to do the best job you can at it. Of course, every single penny raised goes to the Alberta Children's Hospital via Extra Life. And there's big news there that will make my job easier when making that massive donation: Extra Life now accepts Canadian funds! It's something they'd been promising (and something Canadian Extra Life members had been asking for) for a long time. So once the auction is over I'll get back to straight-up asking for donations there. Individuals can't get a tax receipt when they buy something at our auction, but there are a ton of great items and knowing it all goes to charity has got to feel good. 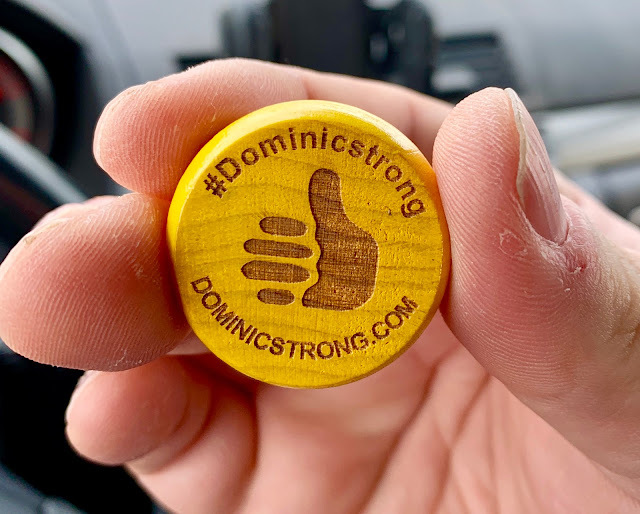 It never ceases to amaze us how incredible our community is: It warms my heart anytime we ask someone about donating and they already know who Dominic is. The auction finishes at 5 p.m. today (Sunday, Sept. 30) so if this is the first you've heard of it, go on Facebook, find the group and check it out! And if you saw this too late I'm sorry for not writing a blog earlier. I'll follow up with the totals next week. Thanks for all your support. This is the biggest thing we do in terms of raising money every year, and without a public game day event this year it has even more importance. We'll still be gaming 25 hours Nov. 3-4, just not at a place anybody can come and play with us. 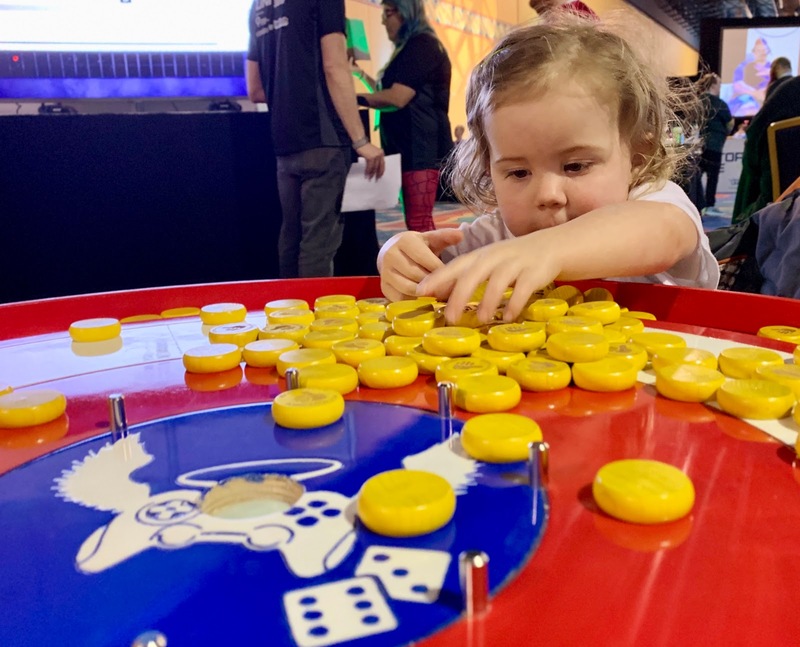 We'll instead encourage gamers of all types to sign up for Extra Life and make their own game day experiences! Last week I took a walk out past his bench and whispered to him. It was cool outside, quiet, nobody and seemingly nothing around on a starlit night after work. It's a one-sided conversation, of course. Three years ago today I cried at his bedside as he drew his last breath. I can remember every bit of that moment and it kills me. How I looked at the clock to remember the time. How Trish didn't want to let his hand go because she was all that was keeping it warm. The room at the Arnold Palmer Children's Hospital in Orlando, with its tiny shower. I vowed to raise him the only way I had left - by doing good things in his name. To keep his memory alive. We are so thankful for the teams and volunteers who came out to the #Dominicstrong mini-golf tournament last month. It raised $950, which equated to US$700 once we put the money through Trish's Extra Life page. They still don't accept Canadian dollars, which remains promised. We ran an impromptu contest this weekend because The Esplanade had donated a pair of tickets to a show Sept. 25 - which takes place before our Sept. 28-30 online auction. We chose to raffle them off, giving ballots for each $5 donated to Trish's Extra Life page. As of the writing of this blog, my sister (who doesn't even live in Medicine Hat) donated $50, a friend donated $10, and that's it. There's been good response for donations for the upcoming auction, but I'm scared that nobody will bid on any of it. I'm aware that's ridiculous. I do worry that Facebook's algorithms are working against us though. Few people react to our posts on the #Dominicstrong page, so will enough people even see or know about the auction when it happens? I've been depressed all week at work leading up to today. I miss him so much. Today I have to work and I'll do my best to do my job. But it hurts every time I think about how he's not here. Trish will stay home with Samantha, and we'll put out balloons again that hopefully two idiot kids won't ruin (like what happened on his birthday last year). And then moments happen like the other night when I whispered to my son. No sooner had I asked how he was doing than a bird, unseen in the night sky, chirped in reply. "I love you too," I managed to say. What else can you do? You've got to keep walking. When your kid is in a hospital things can happen real slow, or real quick. The slow times can feel like forever. Hours sitting in a room, sometimes on isolation where you can't even roam the hallways. Weeks, even months waiting for something to change. Endless procedures and tests. Then something happens and you're literally running to the ICU, or speeding back to the hospital (not that we'd advocate doing either, of course). 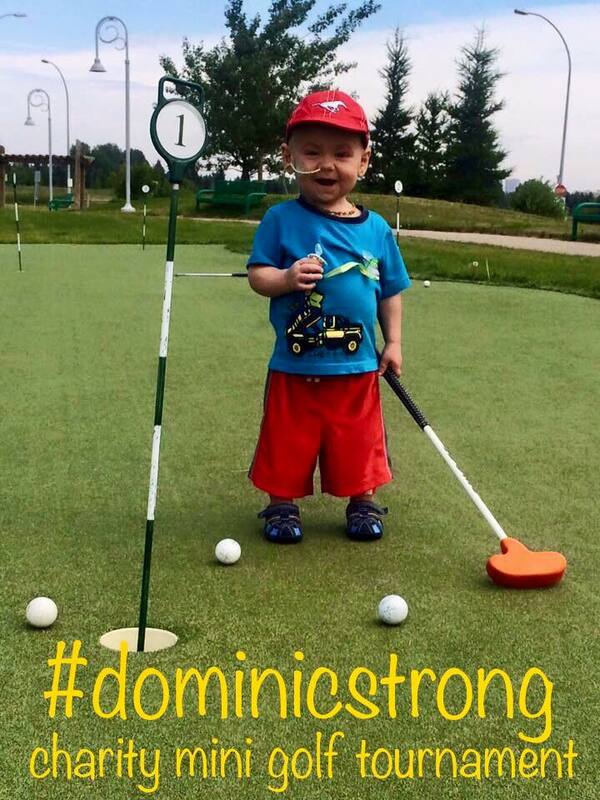 This summer is flying by for us, now just a week until the #Dominicstrong Mini-Golf Tournament at Hooplas. But for another family we've become friends with, it's taken forever. 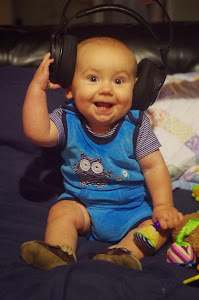 Landon Miller was diagnosed with a rare form of cardiomyopathy last July. Basically, he needed a new heart. 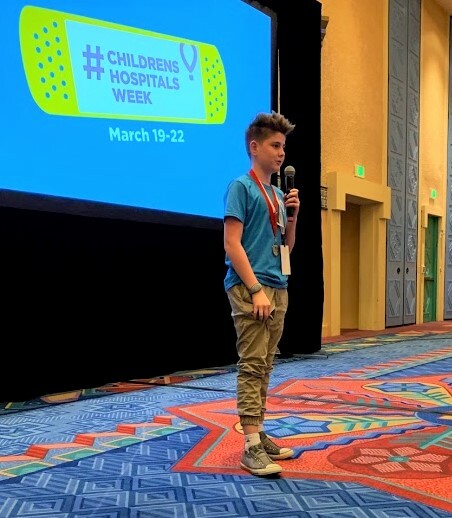 One day, his parents Dave and Julie were helping raise money for the Alberta Children's Hospital through Extra Life, the same charity we've used since Dominic's leukemia diagnosis. Suddenly, they were at the hospital, told they'd be staying there for a long time. Dave had to do what I did, driving back and forth from home (his is in Cranbrook, B.C.) to Calgary on a nearly-weekly basis in order to keep working and still see his wife and child. Those drives can be tough, especially in the winter through a mountain pass, but add to that the stress of your kid's medical situation and it's a whole other level. Julie had to move to another city, basically told a transplant could happen any moment, but that the usual wait list means it could take more than a year. They never stopped giving back, even when they were the ones in need. If anything they're probably more motivated than ever now. They were the reason we attended Cranbrook's big game day last year. I wouldn't be writing this unless we had some news to pass along. It's the best news. 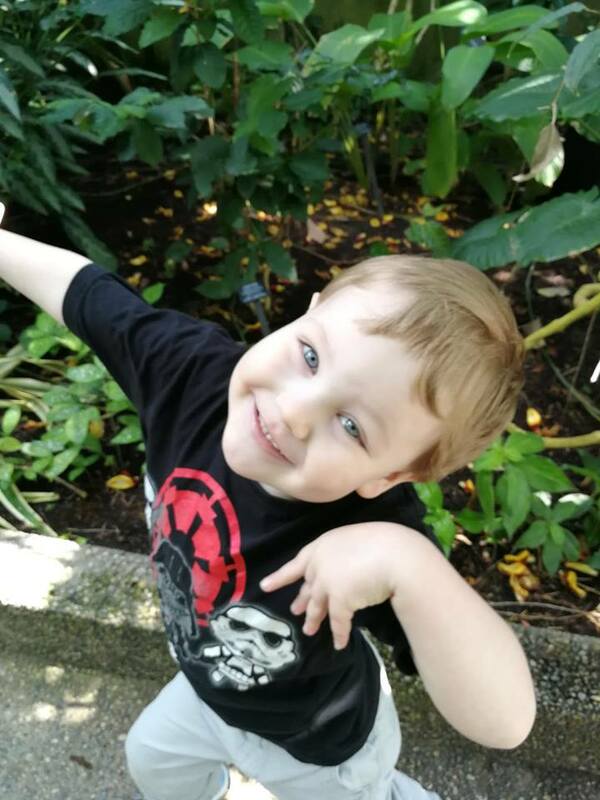 After a year of waiting, last week three-year-old Landon was told he'd be getting a new heart. Of course, that means another child had a heart to give, so the news is both incredible and devastating. For as long as the wait was, once the transplant was happening, it was less than a day before he was in surgery. As of the writing of this blog he's progressing better than anyone expected, able to stand up and quickly ridding himself of any medication. He's a champion. Their road is far from over. The surgery happened at the Stollery in Edmonton, which specializes in cardiology. They'll go back to Calgary soon, but won't be able to return all the way home for at least six months. As Dave notes, you don't want to make that treacherous drive in the middle of winter with a medically sensitive kid. "It's been a long road, but it's nice to be able to see the end, even if it's off in the distance," he wrote to me. We do this charity work so that kids can have the best care when they need it. Sure, Landon isn't from Medicine Hat, but Dominic wasn't from Calgary and that's the hospital we support. There are tons of other kids in smaller cities like ours that have to basically split up their families in order to go to the place they've got the best care. The mini-golf tournament is a week away and we are nervous. 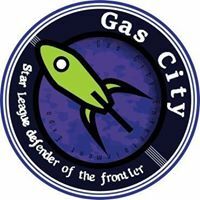 Even though we had a great time last year and it seemed to be well-received, only two teams are signed up as of the writing of this blog. Please, we'd like this to be a success and an event that continues in future years. It's a ton of fun, you play 18 holes of mini-golf, there will be prizes, special fun holes and lots more. We've confirmed that Skinny's Smokehouse BBQ will supply dinner for all of our golfers at no charge! Absolutely incredible. And Schwab and Co. Chartered Accountants are sponsoring the event so that your registration fee will go entirely to the hospital. It costs $18 per person to register, or you can enter a team of four for $70. Please go to hooplas.ca to register. We'd love to see two teams on each hole, honestly. 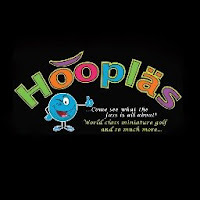 The evening starts at 5 p.m. Aug. 12 at Hooplas. Hope to see you there. Charity plans for the year: Superhero Night, mini golf, online auction and more! People used to ask us how we did it: How do you deal with a kid with leukemia and still have energy to go to work? Well, for one, Trish didn't work - her job was Dominic. And what a job it was. As for the rest of it, well, you just find a way. You don't have a choice. Now we both work and raise a perfectly healthy daughter, and to the people who manage to juggle that plus do charity work, I have to ask: How do you do it? Because I'm finding myself exhausted a lot. And that's just with one kid, who we send to a day home for a couple hours a day when our work schedules overlap. Anyways, life really is fantastic, but it does feel like our charity work has slowed down. We knew it would and we planned for it, but I feel bad for Dominic's sake. We've done so much and we will keep going, just not at the same speed as we used to. There are only so many hours in the day. A few things to talk about today. First, we have dates for all of this year's #Dominicstrong fundraising events! 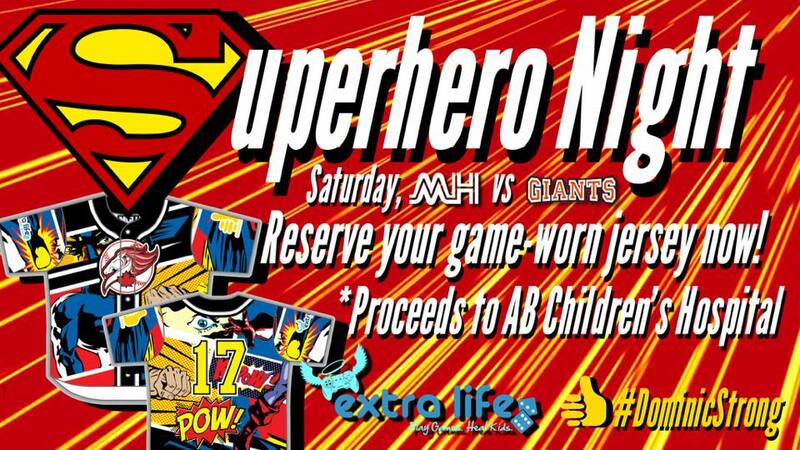 For the second year in a row, the Medicine Hat Mavericks are holding Superhero Night, with special jerseys and promotions and proceeds going to the Alberta Children's Hospital. 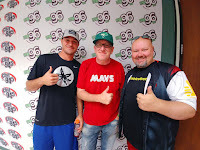 It's Saturday, July 14, as the Mavs play the Edmonton Prospects (the team that beat them out in playoffs last summer). First pitch is 7:05 p.m. I haven't been authorized to share the jerseys quite yet, but last year's were a hit and this year's version is pretty awesome too. The players will wear them for half the game, then they'll be sold off for charity. As always, a huge thanks to owner Greg Morrison, his family and staff who have been so incredible to us in wanting to make this event the best it can be. It was a blast last year and this year will be too! It's hard to believe but Hooplas Family Entertainment Centre will hold a #Dominicstrong event for the fourth time this year. For the second year in a row it's going to be a mini-golf tournament the evening of Sunday, Aug. 12. That's a month earlier than previous years but it's also in the middle of the summer season, so we're hoping lots of folks will come out, play a round, stay for dinner and have a great time supporting the hospital. We'll have prizes, even more special themed holes than last year and it's only a couple hours long, so not a huge time commitment. Stay tuned for how to sign up but in the meantime, go hit the course and fine-tune your game! We've had a booth there in past years but this year's entertainment expo in Medicine Hat will see us as their official charity. The date is Saturday, Sept. 15 and we'll be there, plus I'm going to do a panel discussion about Extra Life! The biggest fundraising venture we do is the online auction, which this year will run Sept. 28-30 through the #Dominicstrong Facebook page. We've had more than 100 items each of the past two years and raised at least $10,000 each time. 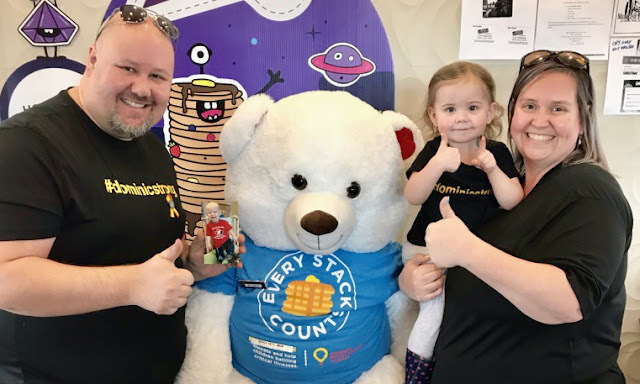 If you (either as an individual or business) want to donate something, please email donations@dominicstrong.com - we won't have as much time this year to get out and solicit donations so we're hoping we hear from a lot of folks directly. I'm sad to say we are not going to hold a public 25-hour gaming event this year as we have each of the past three years. Put simply, it didn't turn out to be worth the amount of work and investment from sponsors that we made back in money for the hospital. We'd rather do our own thing privately and encourage other groups to participate in Extra Life on their own time. 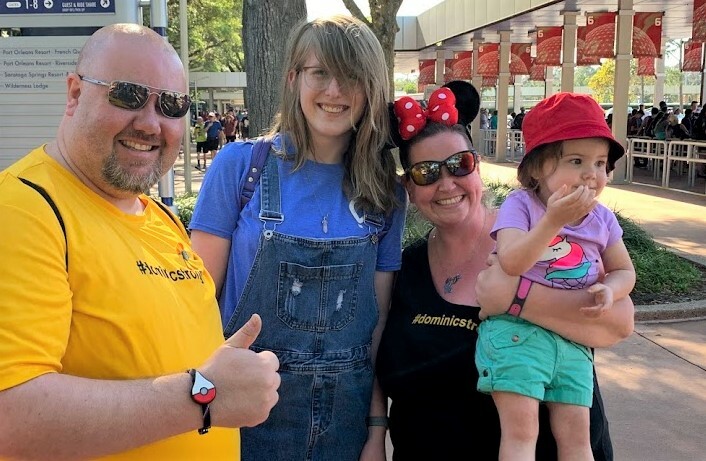 On the plus side, Trish just got approved to take a vacation week during tax season: The Rooney's are going back to Extra Life United in March 2019! It'll be our first time going with Samantha - actually it'll be her first time on an airplane. We have to start saving now however, as airfare is more expensive than ever and she'll be two years old then - no longer free to fly. This final bit of news might only make sense to some folks, but bear with me because I'm a gigantic geek. Trish and I have played Pokemon Go together since it was released in 2016. For those who don't know, it's a mobile game you play by going to real-world locations, then using your cellphone to virtually accomplish tasks in the game while there. The locations are populated using a variety of methods, and this past week the park behind our house where Dominic's bench sits became one of those locations. It's called a Pokestop. And if you are in the game and click on this Pokestop it's identified as the #Dominicstrong Memorial Playground. It's a little way of remembering him and we love it. It also gives us a pretty nice boost in the game itself, being so close to our home!